Gana Unnayan Kendra (GUK) started its journey in 1985 as a community led non-government organization with the purpose of bringing about a sustainable positive change in the lives of disadvantaged poor and extreme poor people living in remote areas especially in the poverty and disaster prone northern districts of Bangladesh. People of these areas have to lead their lives by struggling against flood, riverbank erosion, drought, cold spell and seasonal food crisis. Especially they have to face untold sufferings almost every year caused by flood and river erosion. Usually economy of this area is completely dependent on agriculture which cannot ensure working opportunity for the large nu mber of landless day laborers round the year. During the lean period of work, the poor and extreme poor people do not have any other option than selling their labour in advance. Many male members of families have to go to other places of the country in search of work, leaving the women and children of their families behind in quite uncertainty. During flood, people’s lives & livelihoods become severely vulnerable. On the other hand, people who become affected by river erosion lose their homestead with other assets. They fall in great uncertainty and become distressed. These displaced families take shelter in different raised places. To bring out these hopeless families from the immeasurable worse situation, GUK initiated skill development training programme since 2010. 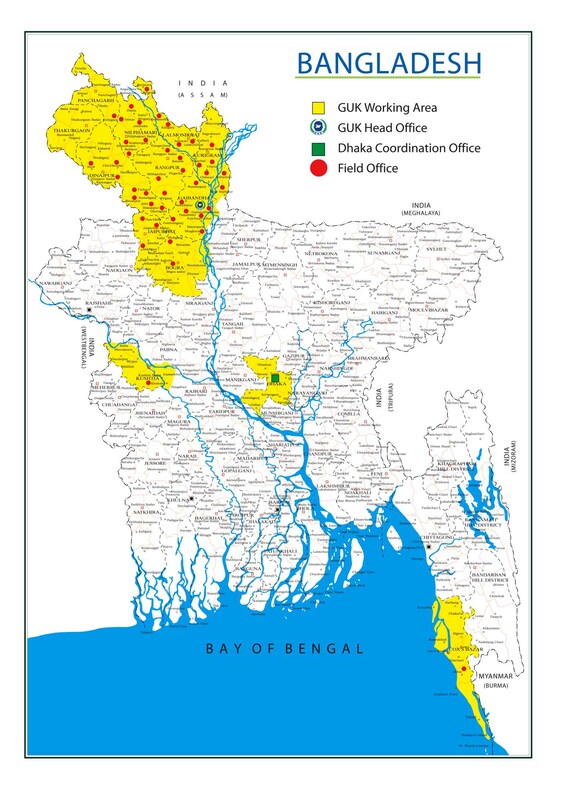 GUK has established well equipped skills development training centres adjacent to its head office at Nashratpur, Gaibandha where there are 9 training venues, 4 dormitories for accommodation of trainees and 400 trainees can receive residential training at a time. Besides, 6 VIP AC (one is accessible for persons with disabilities), Standard Ac 15, Normal Ac 10, Non AC 10, rooms, VIP dinning room, WiFi facilities are available for guests with charming & homely environment. These training centers are equipped with well decorated lab & workshop, modern networking facilities, recreation & indoor games facilities, and skilled & experienced trainers. Through these training centres GUK has been providing skill training on different trades to young boys & girls from poor & extreme poor families and supporting them to get job in garment factories and private sector companies as well as self employment. 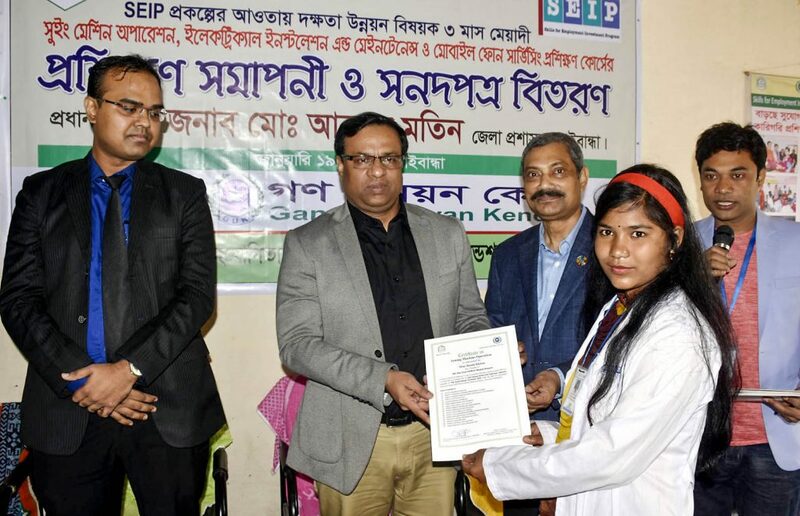 GUK also provide Bangladesh Technical Education Board (BTEB) accredited certificates to the trainees after completion of training. Besides, GUK has also established a Technical institute named GUK Institute of Engineering & Technology (GUKIET) which is duly approved by Bangladesh Technical Education Board (BTEB). The four storied 25000 square feet building of GUKIET is situated on it’s own land with all necessary facilities, Presently, four years Diploma courses in Civil and Electrical engineering and some other short courses (vocational) are providing through this institute. Moreover, GUK has another non-residential training centre at Gaibandha town. Furthermore another residential training centre situated at Gidari union of Gaibandha sadar upazila, 15 kilometer away from Gaibandha. So far, GUK has provided skill training to several thousand youths and most of them are working in different garments factories and other private sector companies including Apex Adalchi Footwear Ltd in Dhaka and other adjacent districts. GUK has good linkage with around 100 factories and BGMEA as well as has signed MoU with 50 garment factories and private companies in regards to job placement of youths. After receiving training the trainees are firstly placed to different garments as intern and later absorbed as regular employee. Moreover, GUK continues follow up the trainees during internship and first 03 months of jobs about their performance and satisfaction of both sides. In all training venues, GUK keeps “First Aid Box’ which contains medicines such as paracetamol, metronidazol, oral saline, pain killer, gauge, bandage, anti septic cream, anti burn cream/ointment, etc. In every training venue and campus, fire safety alarm and fire extinguishers are there. Staffs and trainees received orientation on use of these equipment and other relevant primary care aspects. In addition, GUK maintains good communications with hospitals and other private clinics. GUK has own 05 car/jeep/micro bus and 02 speed boats those are used in case of emergency. In each training venue, GUK supply safe drinking water. GUK has expertise to develop different kind of training module and also can prepare customized training module as per requirement. Since 2010, GUK so far provided skill training on different trades to 5790 young girls & boys and nearly 85% of them are involved with different kinds of jobs and self employment. They are earning money and supporting their family.